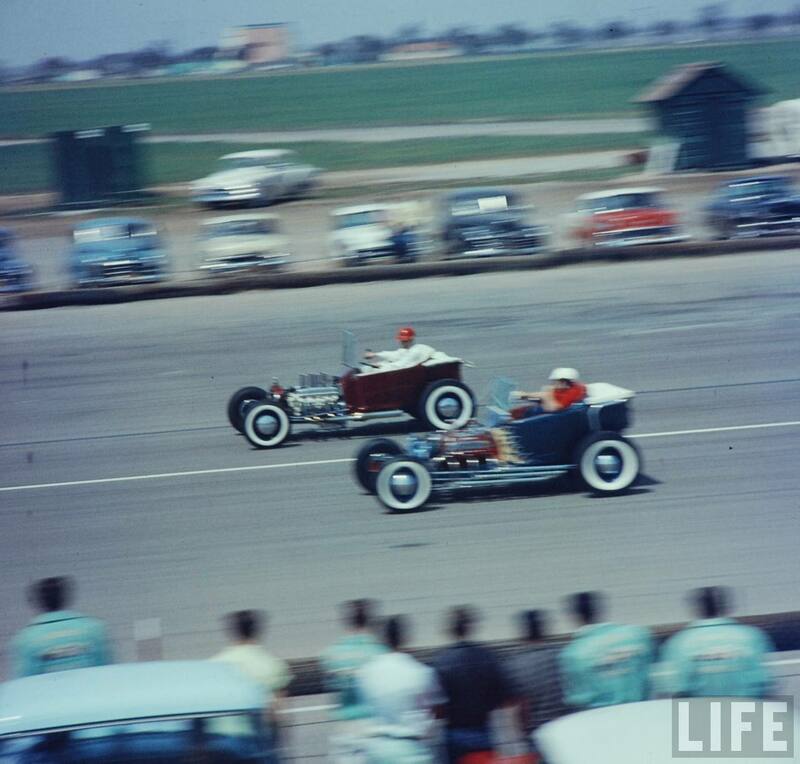 Tommyy Ivo (top) and Norm Grabowski in his famous Kookie Kar square-off at the National Hot Rod Associations drag racing meet held at the old Santa Ana Drag Strip. 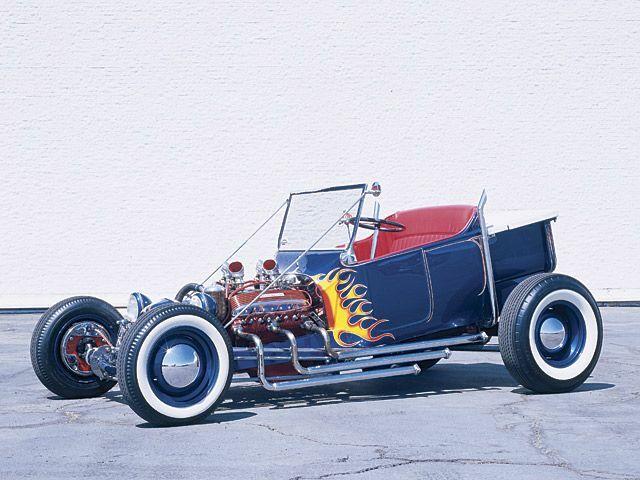 The T-Bucket Hot Rod craze started back in the 1950s, and is still alive and screamin’ today. Norm Grabowski is the undisputed Granddaddy of the 4-wheeled art form, with his original Kookie Kar being an inspiration to the legion of copycat and followers that became a national craze. 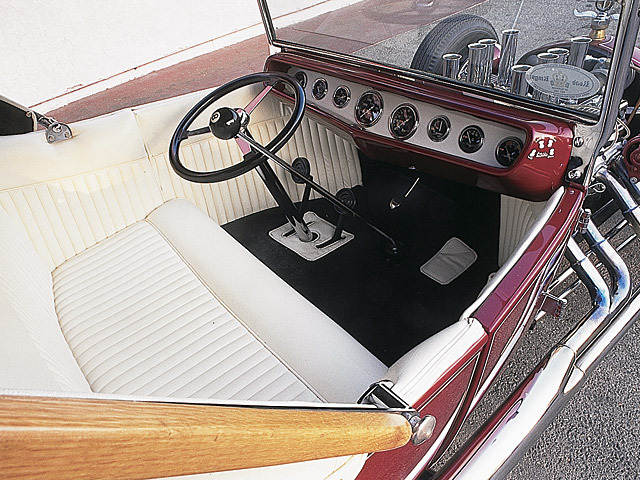 It all started back in 1952, when Grabowski, newly discharged from the service and now a fledgling actor in California, got his hands on an old 1922 Model T Touring front half and dropped a shortened model A pickup bed on the rear. It wasn’t nearly as simple as it sounds– Grabowski painstakingly cut and recut the frame, laboring long and hard to get just the right aesthetic and stance he was looking for. The power was supplied by a ’52 Cadillac engine with a 3-71 GMC blower, and later evolved to a ’56 Dodge engine with a Horne intake sporting a quartet of Stromberg double-barrel carbs. The steering for the beast was supplied by a Ross box from an old milk truck. Grabowski installed it at home, then discovered that the T-Bucket steered backwards. He hopped in the dyslexic Hot Rod and nonchalantly drove her from Sunland, CA to Valley Custom in Burbank for a fix– having to steer in the opposite direction the entire way. Why not? Norm Grabowski behind the "wheel" of his famous Kookie Kar-- a signature feature being the Bell three-spoke steering wheel mounted on the column which was in near upright position. 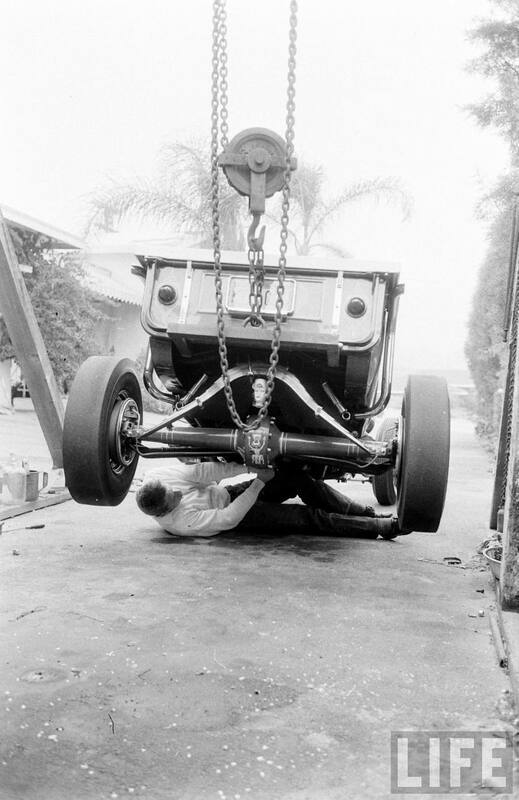 Norm Grabowski working under his Kookie Kar with a homemade hoist-- around '57 - '59 in Sunland, CA. 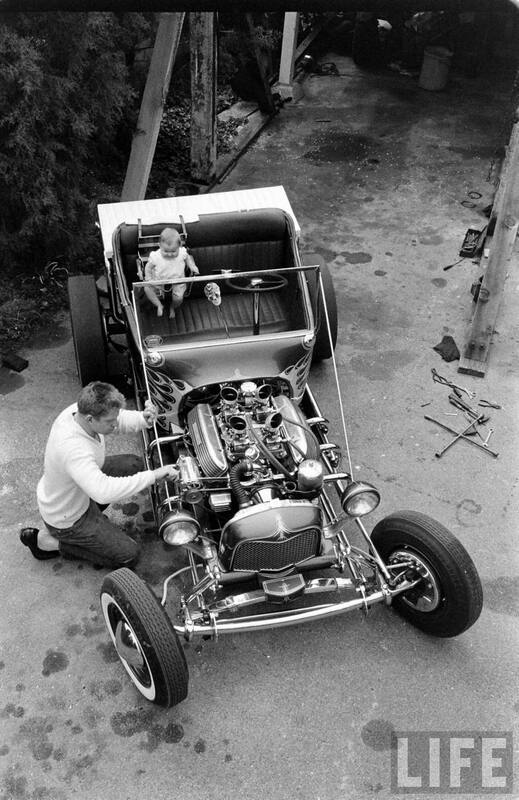 Norm Grabowski working at home on the Kookie Kar-- with baby riding shotgun. Check out the bloodied plaster skull shifter. 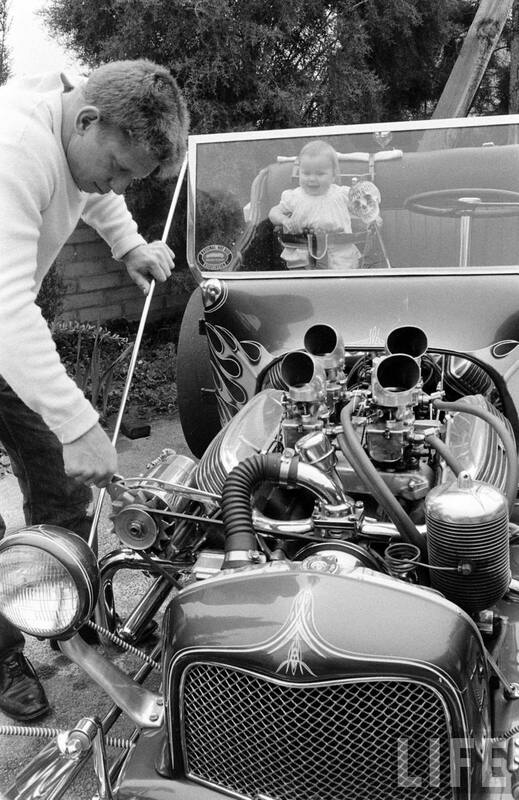 Norm Grabowski and baby at home in Sunland working on the Kookie Kar. OK baby, try 'er now... Norm Grabowski turning the wrench on his Kookie Kar for the LIFE photog's Kamera. Norm Grabowski-- what you'd call a hands-on kinda guy. Somebody's gotta get under there... Norm Grabowski under his Kookie Kar. 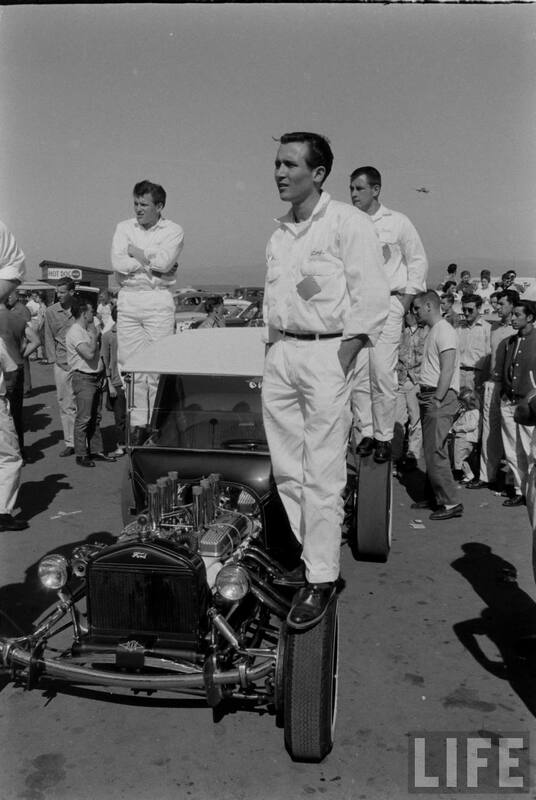 Norm Brabowski ready for race day at the Santa Ana Drag Strip. The Legendary Norm Grabowski Kookie Kar -- Identical clone by Franco 'Von Franco' Costanza. Norm's original was painted by Valley Custom with flame job and pinstriping by Dean Jeffries. Tony Nancy stitched up the rolled and pleated red interior. 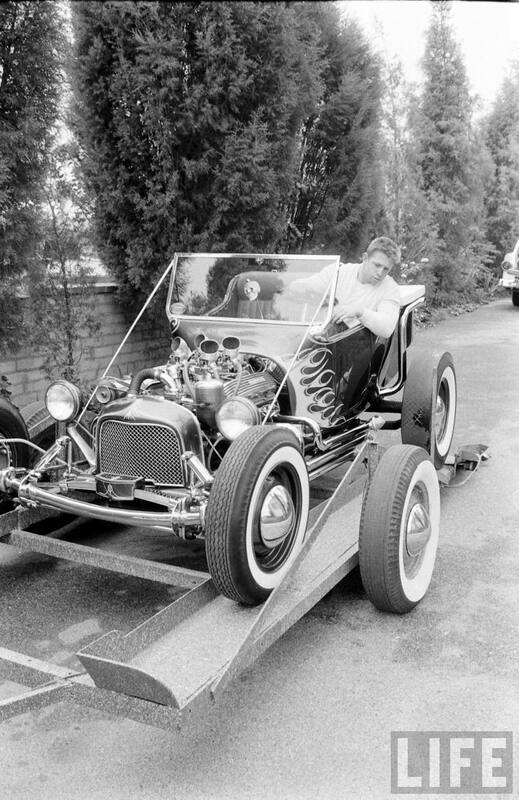 Grabowski’s T-Bucket was so hot on the scene, it soon spawned a movement. 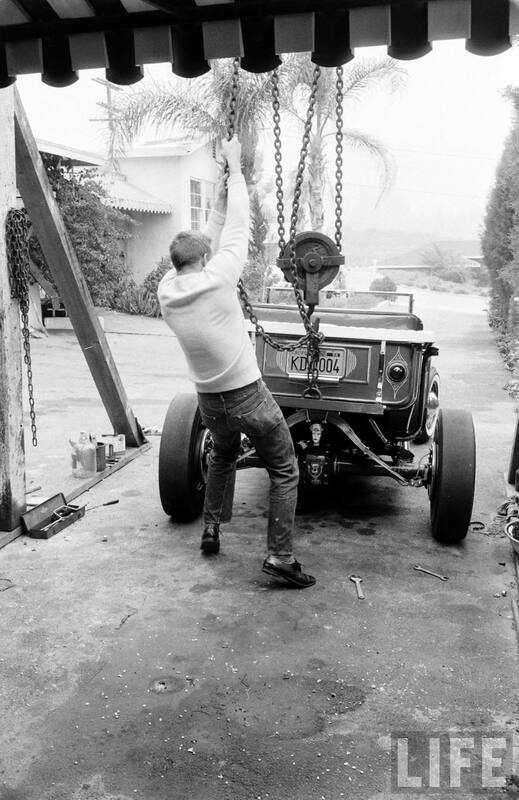 Arriving home one day, he was more than a little surprised to find another actor/racer/builder, Tommy “TV” Ivo, in his garage measuring up the Kookie Kar so that he could make his own T-Bucket Hot Rod. Ivo later recounted– “I asked him (Grabowski) if he would let me take some measurements off of his car,” recalls Ivo, “but he wouldn’t let me.” So when that failed, Ivo took matters into his own hands and snuck into Grabowski’s garage one day when he wasn’t home and took all the critical measurements and visual data needed to go off and create his own. 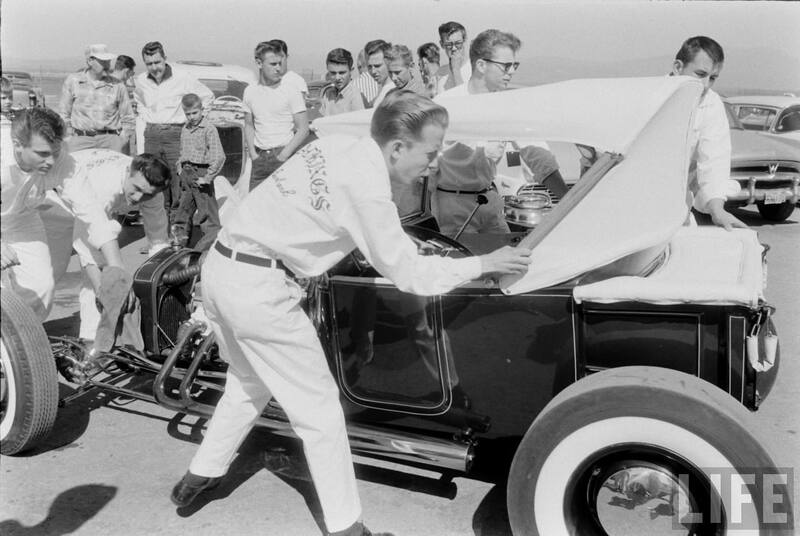 Tommy Ivo Drag racing his "outhouse on wheels" with it's signature white ragtop down for speed. With trusty T-Bucket measurements in hand, Tommy Ivo set out to on the first order of business — finding an old Model T body. Scouring the dry California desert, Tommy finally found a suitable match– a 1925 Ford Phaeton front end. Only problem was the desert had claimed the Phaeton for itself. A Yucca tree had grown straight straight through the middle of the cab, rooting the old ford in place. Undeterred, Ivo claimed victory by chopping the Yucca down and hauling the old Ford back home. With a little help from Randy Chaddock & Max Balchowsky, Ivo made short work of the project– equipping his new T-Bucket with a 322 Buick Nailhead bored out to 402 cubic inches, and setup to use one of three induction systems: a dual-quad manifold, the quintessential six-pack of Stromberg 97s, and the Hilborn fuel injection that has become the car’s trademark over the years. 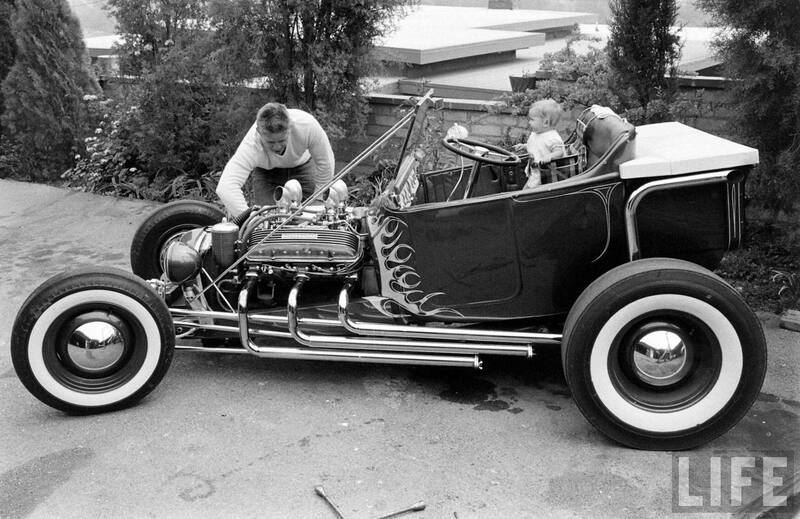 Tommy Ivo's T-Bucket Hot Rod was unmatched in it's class back in the day. 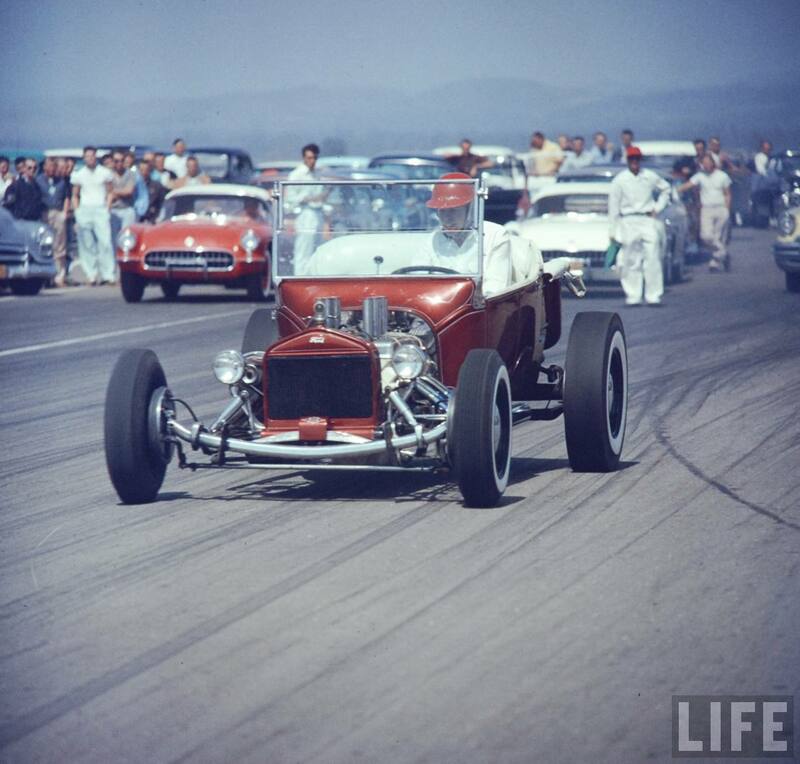 Tommy Ivo's T'Bucket Hot Rod went on to be as big a star, if not a bigger, than the actor/racer himself. Tommy Ivo learned a lot about building hi-performance engines under Balchowsky. “He was my mentor in motors,” Ivo recalled. Ivo put his lethal motor skills into practice and started cleaning-up at the drag strip. Most times he drove home with a trophy, or at least bragging rights to a trophy. “Sometimes I used to sell my trophies back to the track promoter,” recalls Ivo. “I’d take the money and buy more tires.” His passion was purely for the car and the thrill, not the glory. He adds, “All I wanted to do was race. 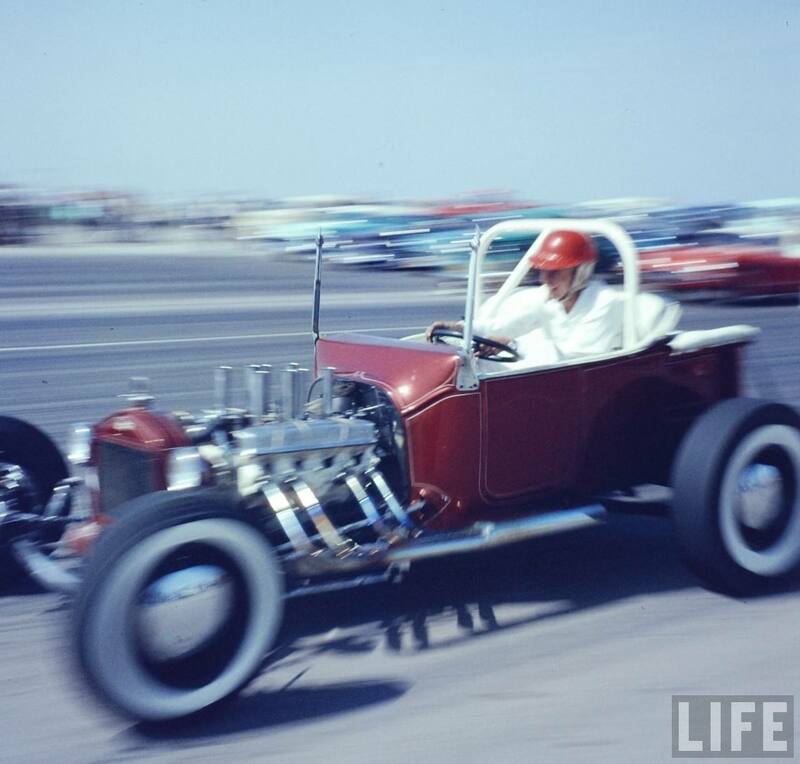 I didn’t care about trophies back then.” Ivo’s hot T-Bucket and racing skill landed him several Top Eliminator awards at the San Fernando Drags and later at Lions when it opened in 1960. The car was a consistent for 11-second elapsed times and a top speed of 119 mph. Tommy Ivo's dark red T-Bucket was accented with a custom white pinstripe job by none other than the legendary Kenneth Howard-- AKA Von Dutch. His signature is visible at the far right end of the dash. 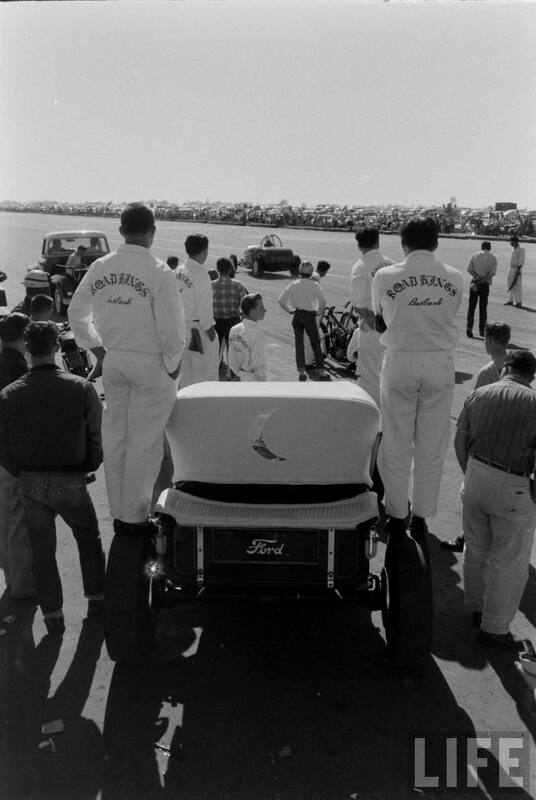 Tommy Ivo and the Road Kings crew wait their turn to tear it up at the Santa Ana Drag Strip-- sometime from '57 to '59. 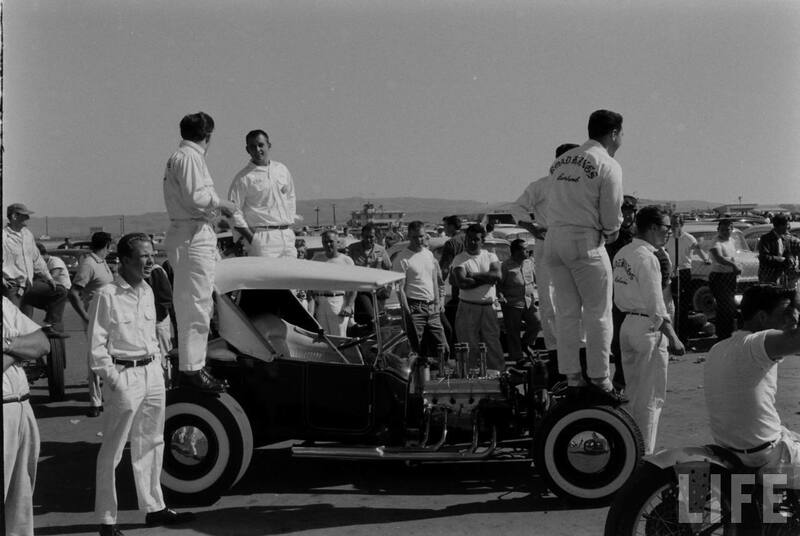 The Road Kings, with Tommy Ivo standing at far left, seem ready for another pass at the Santa Ana Drags. 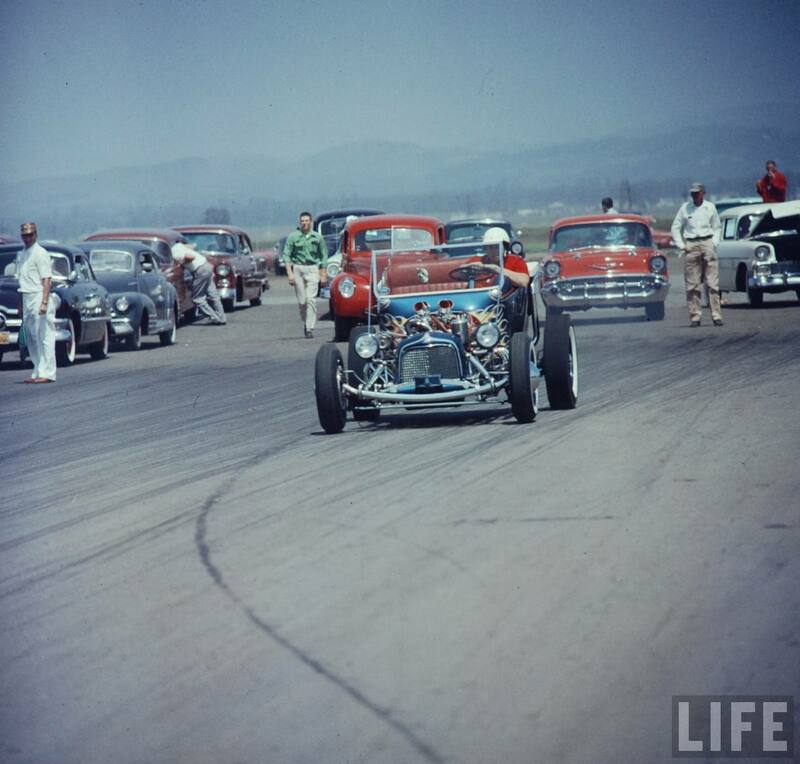 The car appears much as it does today, with Hilborn fuel injection, race slicks, Mercury hubcaps, and full top. 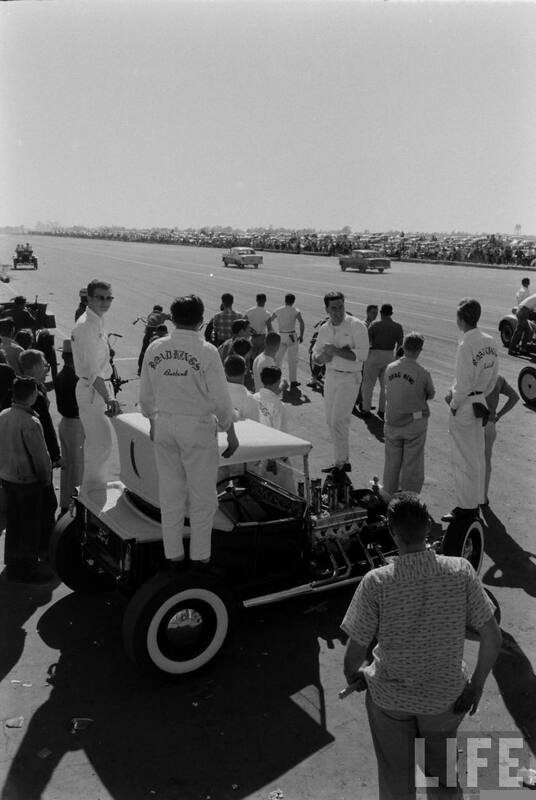 The Road Kings take advantage of the view atop Tommy Ivo's T-Bucket tires-- Santa Ana Drag Strip. 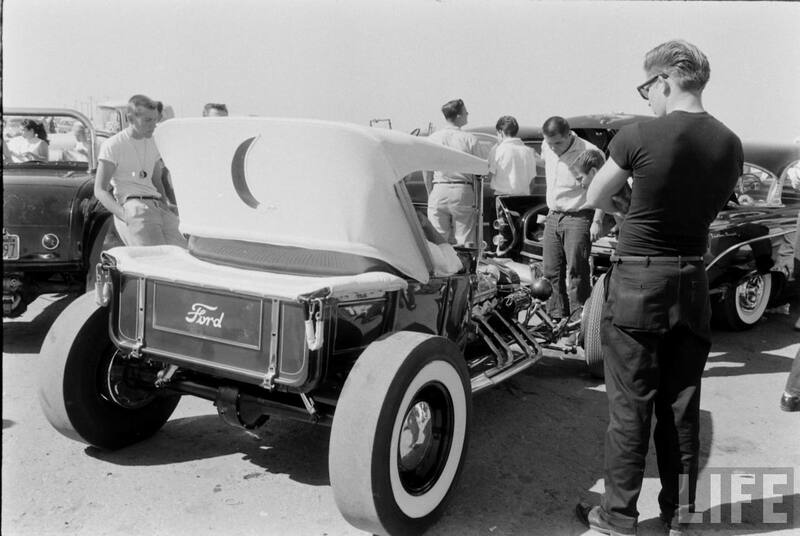 ...As Tommy Ivo explained, the Hot Rod, with top up looked "like an outhouse on wheels." And so came the crescent moon cut-out window came to be. There's another clear benefit to no fenders. To the victor go the spoils! 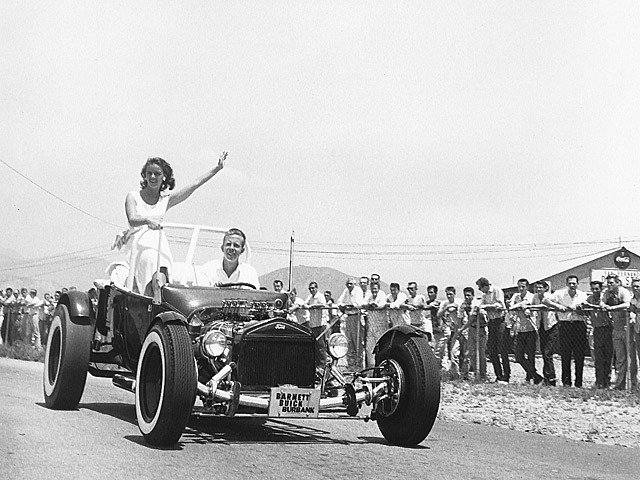 After winning Top Eliminator at the San Fernando Drags, Tommy Ivo and the trophy queen make a victory pass. 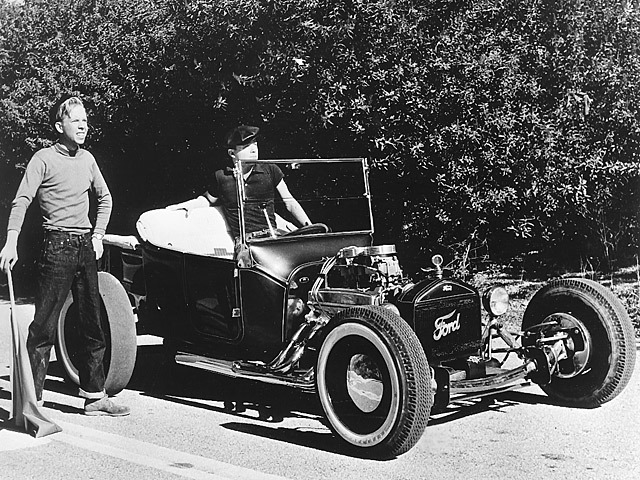 Tommy Ivo and his T-Bucket were featured in the Hollywood production "Dragstrip Girl". Ironically, Ivo played the heavy in the movie, and the script called for him to steal his own car.